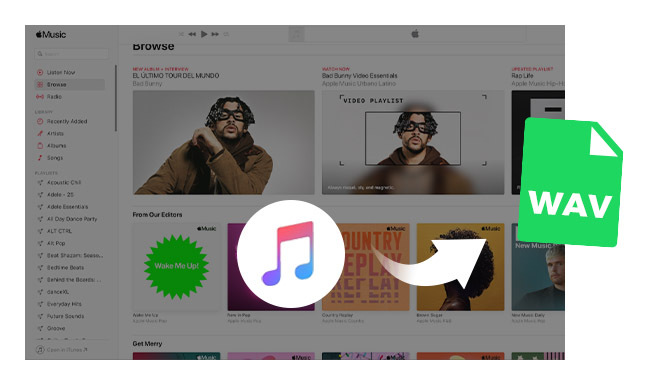 Talking about converting iTunes music to MP3, WAV, AAC or AIFF audio, most of people will think of of iTunes, which can help you easily convert music to those formats. But it is not the case now for converting Apple Music songs. Why? Because Apple Music songs that you download are DRM protected. So, you cannot convert Apple Music songs simply with iTunes. 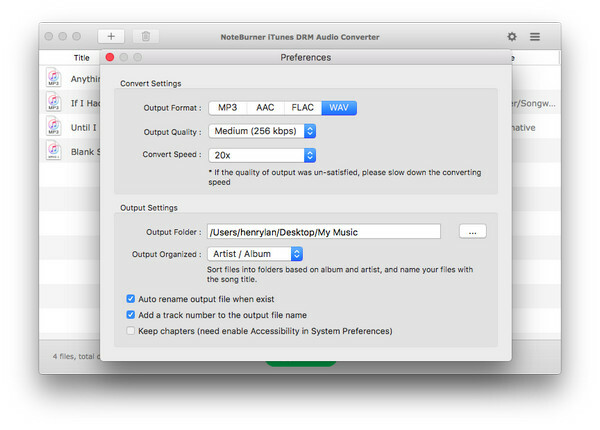 Here the article will introduce you a powerful converter to help you convert DRM-ed Apple Music songs to WAV, MP3, FLAC or AAC. Since 2009, Apple has removed DRM from iTunes downloaded music. This makes it posible for iTunes users to convert iTunes music to MP3, WAV, FLAC, AAC or other formats with iTunes. But, the release of Apple Music called DRM back. Apple Music has a DRM (digital rights management) component just like every other streaming service. Thankfully, there comes Apple Music Converter to help you convert DRM-ed Apple Music songs to plain WAV, MP3, FLAC or AAC. 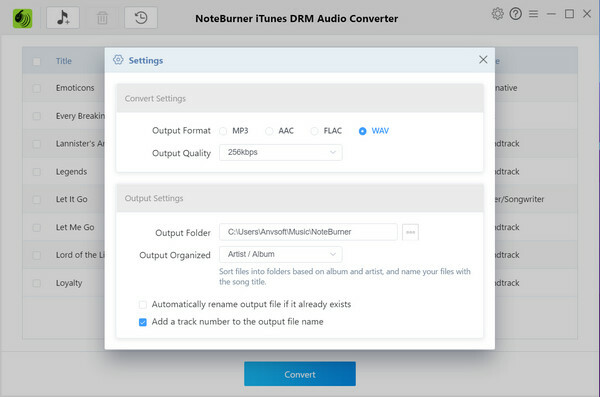 Among the many Apple Music Converters, NoteBurner iTunes DRM Audio Converter is highly recommended, which is a professional Apple Music Converter to help you remove DRM and convert Apple Music songs at 20X faster speed with lossless quality. Also,both Windows version and Mac version are available. You can download the program to have a try. The following tutorial will teach you how to remove DRM from Apple Music songs thus to convert them to WAV on both Windows PC and Mac PC. Step 1: Launch iTunes DRM Audio Converter on Windows. Click "Add" button, then you will see a pop-up window which will show you all the iTunes folders. You can add Apple Music files you want to convert to WAV. Step 2: Click the "Setting" button showed on the above picture, and then there will be a pop-up window which allows you to set output path and output audio format. To convert Apple Music songs to WAV, you need to set the output format as WAV. Step 3: When finish customization, click "Convert" button to start converting. After conversion, click the "Output" button in the main interface to find the output WAV audio. Once checking the output WAV format, you will find that the file size is much bigger than the original files. This is because the WAV format is uncompressed audio format. Step 1: Launch iTunes DRM Audio Converter on Mac. And then click Add button to add any music file you want to convert to WAV. Step 2: After adding, all your added files will be listed in the main interface. Click the setting button to choose output format as WAV. Also, you are allowed to choose output path and conversion speed. Generally, conversion speed as 20X is highly recommended. Step 3: Now, all you need to do is to click the "CONVERT" button. Your music files will be converted at 20X faster speed to WAV. Click the history button, you can find the converted WAV files. With NoteBurner iTunes DRM Audio Converter, you will find it's easy to convert Apple Music songs to WAV or other formats like MP3, FLAC and AAC. If your songs are out of DRM protection, you can simply convert them with iTunes. Let's learn how to convert songs to different audio formats with iTunes. Step 1. Open iTunes Preferences. Step 2. Click the "General" tab, then click the "Importing Settings…" button in the lower section of the window. Step 3. From the Import Using pop-up menu, choose the encoding format that you want to convert the song to, then click OK to save the settings. MP3/AAC/FLAC/AIFF/WAV Encoder is available to choose. Step 4. Select one or more songs in your library, then from the File > Create New Version menu, choose "Create [format] Version". The format shown is the one that you chose in step 3.